With all the angst and the David Fincher crimescenes and the reshuffled storylines of the New 52, it’s sometimes difficult to remember that comics are supposed to be fun. I have no background whatsoever with this new version of Blue Beetle, but Bedard and Guara use the debut issue of this series as an effective introduction to the Blue Beetle mythos and the latest incarnation of this classic comic book character. The Blue Beetle is kind of poster child for the sort of cathartic hiccups DC goes through every few years. Often these reboots clean out unnecessary baggage accumulated by bad story ideas or “clever new takes” that don’t pan out with readers. But the company also occasionally uses them to incorporate characters from other companies it has accumulated. The company used 1985’s Crisis on Infinite Earths, the blueprint for DC reboots, to incorporate characters previously published by Charlston Comics, and the Blue Beetle played a significant role in the 12-issue maxi-series. This new Blue Beetle is Jaimie Reyes, a high school kid in El Paso, Texas. After a brief intergalactic prelude showing an alien wearing Blue Beetle armor trashing his home planet, the rest of the issue focuses on Jaimie as he struggles through his school life. There’s his gangsta pal Paco, their lovely young friend Brenda, and a bully named Joey Gonzalez. Brenda is throwing a big party at her rich aunt’s house, and everyone wants to go. Brenda’s aunt, it turns out, is a well connected criminal. She has employed a trio of local supervillains (a werewolf, a flying scarecrow, and a Day of the Dead-themed gymnast ninja-guy) to steal a Blue Beetle space probe that has been passed around since it fell to earth in Mayan times (in the prologue). But the aunt’s goons find that another group has beat them to the site. Brotherhood of Evil members Phobia, Plasmus, and Warp already have the Beetle in hand, and are about to teleport back to Paris. As the two groups of villains battle out in the street, Jaimie and Paco drive by, slamming into the combatants. Somehow the Beetle shakes loose of its bag, and attaches itself to Jamie’s spine. In a beautifully drawn final spash page, we see Jamie in full-on Blue Beetle power armor, looking very much like the homeworld-destroying alien menace in the opening scene. Boy, that Blue Beelte armor looks cool. The previous guy’s costume was neat and all, but he was really just a guy in a spandex suit with some goggles. This version (which predates the reboot, but which I haven’t really looked at before) manages to look fresh and modern while at the same time classic. The mask’s design and the juxtaposition of contrasting colors takes a cue from Mister Miracle, giving the look a Jack Kirby appeal. 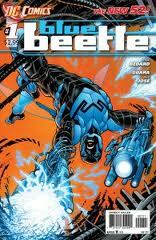 From the exciting cover it looks like this Blue Beetle can turn his hands into guns and stuff, which ought to be fun. While we haven’t seen much of what the Blue Beetle can do, the focus on Jaimie helps to establish an empathic link with the character. I think I get a sense of how this guy navigates his school and family life, but how he handles his life as a superhero is what will make or break this comic, and we haven’t seen enough of that yet to know whether or not this will work out in the long run. For now, Bedard and Guara provide a good hook into their character, a good jumping on point, and an authentically diverse voice fitting Jaimie Reyes’s Latino origins. I don’t know yet if this comic is for me, but I’m pretty sure it will find its audience easily enough. The one supervillain I recognized is the man with the knives. He’s Brutale, who debuted in Nightwing’s solo series. He has a South American background, so I wouldn’t be surprised if all the villains under the aunt’s control are from either Latin America or the southwest states. I suspect so. The werewolf was kind of boring, but the other two looked pretty cool. Not “Brotherhood of Evil” cool, but still pretty cool.